PCL Construction Management Inc. achieved a significant construction milestone today: substantial completion of the new $278.2 million Mosaic Stadium in Regina. PCL was recognized for their hard work by the City of Regina today during a key ceremony attended by approximately 300 guests. PCL has been working toward this goal for more than 800 days since we first broke ground at Evraz Place in June, 2014. "The Stadium project, as part of the larger Regina Revitalization Project, represents a once-in-a-generation opportunity to create an iconic community gathering place in an urban entertainment district," said Mayor Michael Fougere. "PCL has been a vital part of this endeavor, and we thank them for their diligence in getting the project completed on time, on budget, and safely." Sean Hamelin, PCL Regina District Manager, said, "The talented and dedicated individuals who worked on site and in support of this project should be extremely proud of what they accomplished. They worked collaboratively, sharing in the success and setbacks, with a common goal of creating something they can be proud of. They have achieved that goal and created a facility the City and Province can be proud of." As well, being a citizen of Regina, Hamelin thanks the City and the Province of Saskatchewan for their vision of "building a multi-purpose sports and entertainment facility that will meet our community needs for many years to come." The stadium is the first landmark project of the three-phase, $1-billion Regina Revitalization Initiative being undertaken by the City, and is being heralded as one of the most recognizable buildings in Regina, the Province, and the Canadian Football League. 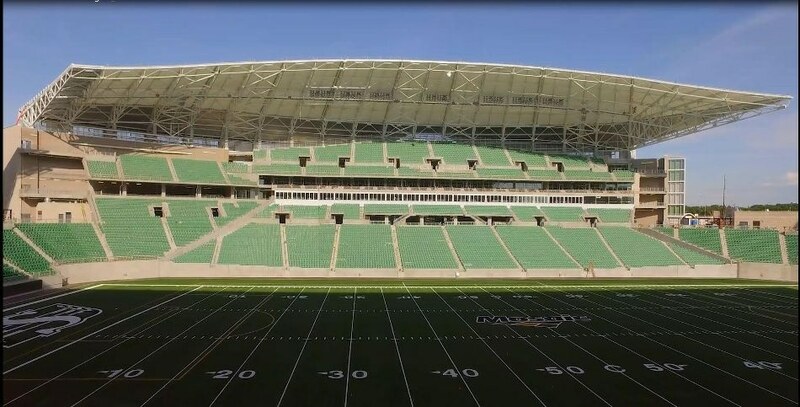 In addition to being the new home of the Saskatchewan Roughriders, the stadium has the built-in flexibility to host different sports and entertainment events at various scales and capacities, throughout all four seasons. It is a modern improvement over the existing stadium, with its translucent spectator roof and a continuous, wide concourse around the facility. Enhancing the spectator experience is that 68 percent of the seats are located in the sunken lower bowl, all with unobstructed views of the field from each seat. Another new feature is the general admission lounge located on the west side of the facility that is accessible to all fans. Now that substantial completion has been met, the focus is on operations and event testing. The public will get a chance to see stadium progress at the second scheduled "Sneak Peak" on Sept. 3, 2016. The event, which runs from 8 a.m. to 4 p.m., is being held in conjunction with Rider Fan Day. The first football game to be played will be on Saturday, Oct. 1, 2016, when the University of Regina Rams square off against the University of Saskatchewan Huskies in a Canadian Interuniversity Sport Canada West football game. For additional project information, including a project timeline and photo gallery, see the Stadium Project website.